﻿Supposedly Republicans will coalesce behind former Massachusetts Governor and establishment candidate Mitt Romney. I am not sure I buy that. 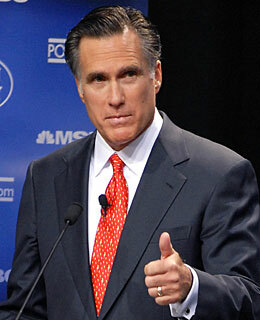 Romney appears to have made no inroads whatsoever beyond his typical 20 to 25% of the Republican electorate. Worse yet for him, he trails in most state polls. Here is a review of who is ahead in the most recent state polls (dating back to October 25th) according to realclearpolitics.com. Of the 14 states with recent polls, 9 have a candidate leading who is not named "Romney." One might think that the demise of Cain's candidacy would help Romney, but the decline of the anti-Romney candidate never does. Although former Speaker Newt Gingrich has a lot of baggage, and has flip-flopped on some issues like Romney, I am not so sure he won't ultimately win the nomination. He appears to have momentum. Let's see if his honesty about the immigration issue brings down his numbers in the days ahead. Also, don't be surprised if Ron Paul's numbers begin to rise as Cain appears to be leaving the race. Actually, with Cain's numbers falling in several states (and Perry's as well), it seems to proportionally benefitting Gingrich. I also wouldn't count out Perry. Yes, his debate performance has sucked. But he's the only candidate not named Romney who is running a serious campaign with ads and a ground game. All the others, sans Ron Paul (who is Ron Paul and won't get the GOP nod), are either on book tours, or are just not too far behind to gain traction at this point (and that includes my personal favorite, Jon Huntsman). This also leads me to another thing, which Joe Scarborough picked up on a few days ago on MSNBC. So why is Huntsman behind? Because he's not going around calling Obama a Kenyan, a socialist, a communist, etc...which is something that has been consistent with the "Not Romney" candidates. They've all tossed these types of bombs at some point or another.